PopCap Games is back with yet another casual puzzle game they hope to get people addicted to everywhere. 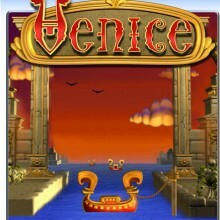 Their latest title Venice Deluxe is developed by the folks over at Retro 64, developers of popular shareware titles such as Cosmo Bots. Venice tasks players with preventing the buildings of Venice from sinking by restoring the treasures of each building. While it isn’t quite up to the usual standards one would expect from a PopCap title, Venice Deluxe is still a worthy title for fans bored of other puzzle titles. There are four modes of play in the game, Journey, Flood, Trick Shot, and Survival. Journey and Flood are open from the start, while the other two are unlocked by beating the two default modes. Journey is the main meat of the game, tasking players with shooting the right piece into the corresponding plate piece. If a piece falls back towards your boat, you must catch it or lose a life. It may sound simple, but some of the levels are designed quite well. There is a focus on getting combos, and score is also calculated on the time it took the player to complete each level. The second mode of play is much more frantic. In Flood the water your boat is on is constantly rising, and the goal is to not let any of the plates completely sink into the water. This makes combos a necessity, as if you just randomly shoot pieces every which way the water will actually rise faster. Trick Shot consists of one off puzzles which task the player with either hitting a specific plate or forming combos that take out all plates in one shot. All of the gameplay modes are fun, but Journey and Flood will likely occupy most of the player’s time. It’s nice to see that Retro 64 took the time to create four fully developed game modes, but Venice ultimately isn’t as addictive as Peggle or Bejeweled. While some people will be motivated to make it through the main Journey mode and perhaps the Flood mode as well, few gamers are likely to stick around long enough to see the other two. Venice just doesn’t have the same kind of staying power that the average PopCap title typically would, which is unfortunate. Another area where Venice Deluxe falters would be in its graphical presentation. Venice is fairly competent, and features bright and colorful game pieces and backgrounds. However, for a PopCap published game, it doesn’t have the same level of polish that one would expect. There isn’t enough variation between background themes and the game just doesn’t have enough of its own uniqueness to truly stand out from the hundreds of other shareware puzzles games available. The sound is well put together though, as the music is light and enjoyable without ever distracting the player from the game itself. Sound effects are what one would expect from a puzzle game as well, for better or worse. Venice Deluxe offers a good deal of replay value, but not every gamer is going to find it addictive enough to see through to completion. While it is still a successful shareware puzzle game, Venice just doesn’t have the same “spark” that most games under the PopCap Games label usually have. But despite that, if you’ve become burnt out on other puzzle titles and are looking for a decent diversion Venice Deluxe is still enjoyable enough to recommend, even if it only holds you over until another addicting game comes out.